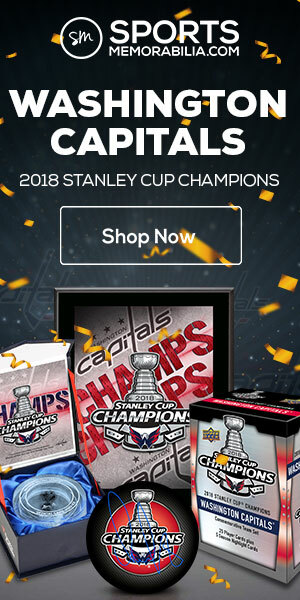 This ornament feels very different than the prior two – Wayne Gretzky in 1997 and Mario Lemieux in 1998 – in that Howe was from a different time, having played the bulk of his career in the “Original Six” era. In a way, that makes this ornament feel more old-timey, like something you would hang from a Christmas tree. 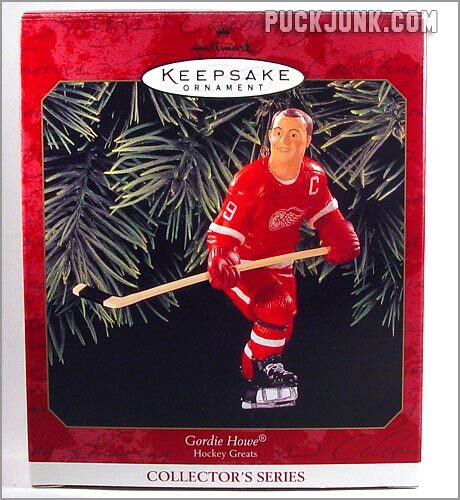 Unfortunately, this ornament – and all future hockey ornaments by Hallmark – did not come with a hockey trading card. Learning the sport with secondhand skates and discarded, broken sticks, Gordie Howe brought a unique talent and determination to the game. He was spotted by scouts when he was playing junior hockey in his native Saskatchewan, Canada. In 1946, at age 18, he joined the Detroit Red Wings and began a record-setting career. “Mr. 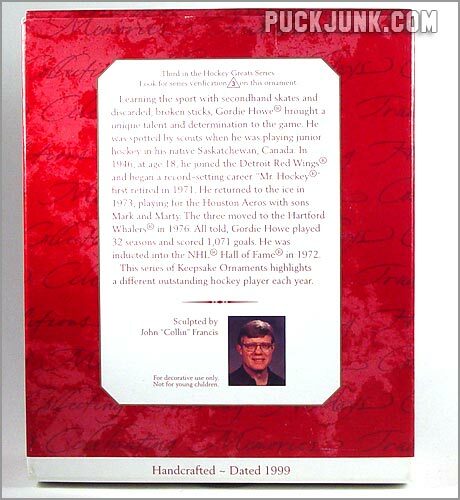 Hockey” first retired in 1971. He returned to the ice in 1973, playing for the Houston Aeros with sons Mark and Marty. 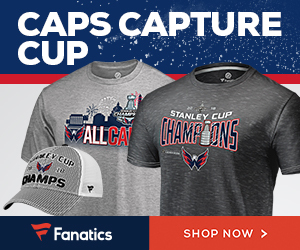 The three moved to the Hartford Whalers in 1976. 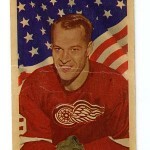 All told, Gordie Howe played 32 seasons and scored 1,071 goals. He was inducted into the NHL Hall of Fame in 1972. 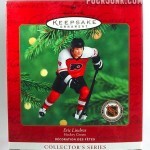 This series of Keepsake Ornaments highlights a different outstanding hockey player each year. Underneath this is a small photo of John “Collin” Francis, the sculptor of the ornament, as well as a fine-print reminder that the ornament is “for decorative purposes only” and “not for young children. 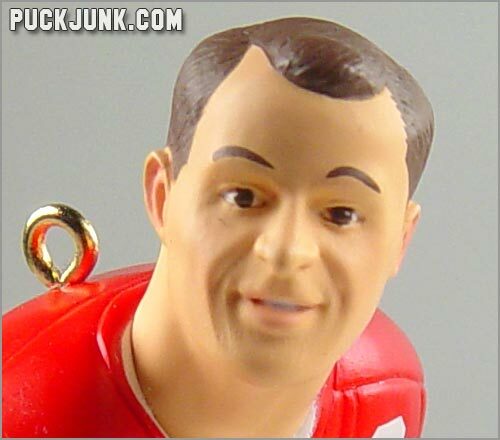 Howe’s likeness on the ornament is good, but a bit young looking. 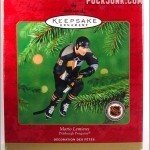 The sculptor – John “Collin” Francis – also sculpted the previous year’s Mario Lemieux ornament. Both the Lemieux and Howe ornaments look too young to resemble these guys in their late 20s or early 30s. The hairline -as well as the inclusion of the “C” on Howe’s jersey, designating him as team captain – leads me to believe that Howe is supposed to be in his late 20s here. But facially, he looks 18. Still, I’d say the likeness, while not perfect, is recognizable. 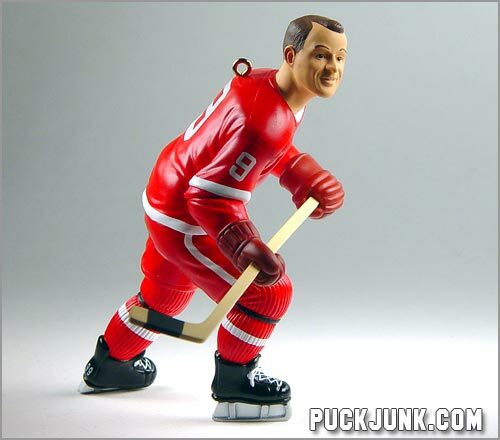 As far as the Hallmark hockey ornaments go, this one has the best likeness of the player that it is based on. Future releases would not resemble the players that they are supposed to be. 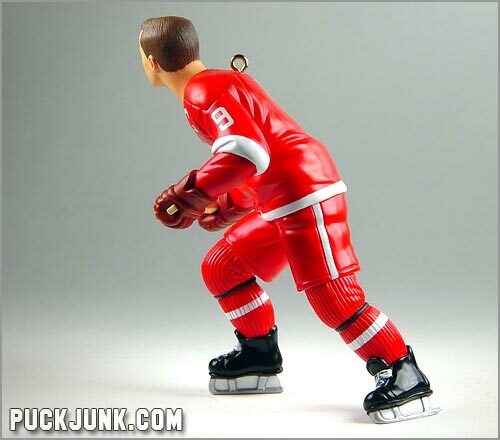 Gordie Howe is skating forward and looking a bit to his right, so the ornament looks good from several different angles, and not just straight-on. Unlike the prior two ornaments, this one will stand up on its own, and actually looks cool if you display it that way. 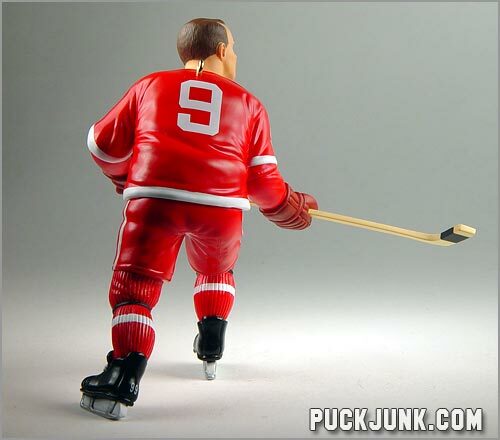 Hallmark has done a great job on all of their hockey ornaments thus far, and this one is no exception. 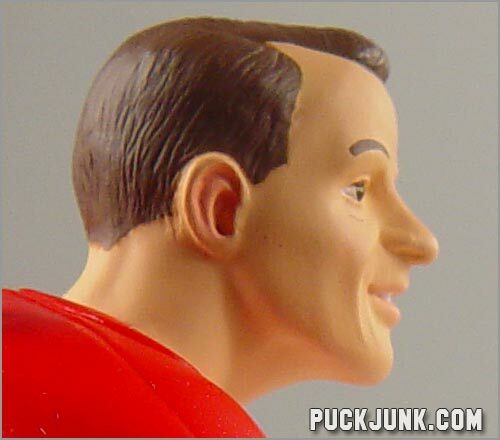 The details are accurate, from the design of the ice skates to Howe’s trademark receding hairline. The pose and detail are great and the likeness – while a bit young looking – is done well. I still wish this came with a trading card, though. 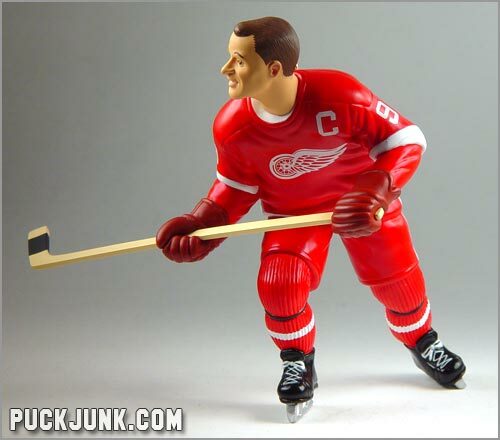 Overall, this is a very nice item to own, especially if you are a fan of Gordie Howe or hockey figurines.